During the last two decades, the flies used in Norwegian salmon rivers have changed. then were completely different than they are today. cooler that those in my older fly tying books. The materials were different and he used some sort of clear plastic tube I hadn`t seen before. The fly looked new and fresh. Since that day, I’ve closely followed the progress of what is now called the Scandinavian tube fly tying style. Nothing in that paragraph causes me to want to read the entire article. 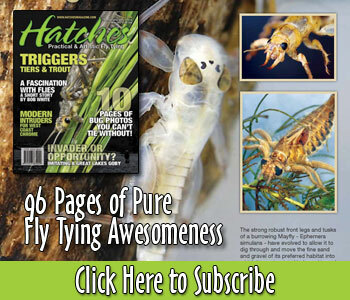 Everything has changed in flytying, materials, method of applications, glues, thread, hook forms and who supplies them.